Khalil DRIRA received the Engineering and M.S. (DEA) degrees in Computer Science from ENSEEIHT (INP Toulouse), in June and September 1988 respectively. He obtained the Ph.D. and HDR degrees in Computer Science from UPS , University Paul Sabatier Toulouse, in October 1992, and January 2005 respectively. He was from oct 1992 to spet 2010, Charg� de Recherche, and he is since oct 2010 Directeur de Recherche, a full-time research position at the French National Center for Scientific Research (CNRS). 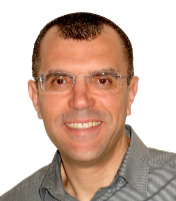 Khalil DRIRA�s research interests include formal design, implementation, testing and provisioning of distributed communicating systems and cooperative networked services. His research activity addressed and addresses different topics in this field focusing on model-based analysis and design of correctness properties including testability, robustness, adaptability and reconfiguration. He is or has been involved in several national and international projects in the field of distributed and concurrent communicating systems. He is author of more than 150 regular and invited papers in international conferences and journals. He is or has been initiator of different national and international projects and collaborations in the field of networked services and distributed and communicating systems. Khalil DRIRA is or has been member of the programme committees of international and national conferences. He is member of the editorial board of different international journals in the field of software architecture and communicating and distributed systems. Khalil DRIRA has been editor of a number of proceedings, books and journal issues in these fields.